Confocal microscopy is a powerful tool that can be used to create 3D images of the structures within living cells and to examine the dynamics of cellular processes1. For high-speed imaging of fluorescent molecules and structures within living cells, microscopes must provide rapid field-of-view scanning that eliminates any out-of-focus light planes that can obscure fluorescence2. Several confocal microscopy methods ensure such light planes are removed2 and these techniques have become increasingly popular over recent years, owing to their exceptional image quality, relative ease-of-use and multiple applications in different research fields. The main types of commercially available confocal microscopes are the confocal laser scanning microscope and the spinning-disk confocal microscope. Confocal microscopy technologies were introduced more than 40 years ago, but advances in optical design, spinning-disk technology and camera technology have fuelled the expansion and versatility of the technique3. Confocal laser scanning and spinning-disk confocal microscopy allow researchers to generate 3D images of organelles within living cells and examine changes that occur in cells over time. Confocal laser scanning microscopes only allow for a relatively slow image acquisition speed3. Single-beam lasers generally scan at rate of 1 microsecond per pixel, which is too slow to capture the dynamic, millisecond events that would reveal the complex molecular processes within living cells3. The confocal laser scanning microscope can be used with high numerical aperture lenses but the fluorescence speed is limited because only about one cubic micron of light can be obtained from the fluorophore within the scanned beam’s focus4. Advances in spinning disk technology have allowed for the development of the spinning-disk confocal microscope, which has allowed researchers to use lower light levels and obtain more accurate cell phyiology with lower fluorophore concentrations. For example, a fluorophore can become excited on illumination and the light emitted is proportional to the strength of the incident excitation, but the fluorophore exsists in an excited state for a significant amount of time. Consequently, over time the ground state becomes depleted. Increasing the illumination power of the excitation source at this point does not generate anymore signal because the fluorophore is saturated and thus, the image is degraded4. However, reducing the power of the excitation source does improve the images, but it lowers the speed at which an image with a given signal-to-noise ratio can be obtained4. Speed limitations can be overcome using parallelism, the application of a line or an array of pinholes. This approach was first introduced by a German physicist called Nipkow4. A “Nipkow” disc or spinning disk is opaque, with the exception of the presence of thousands of pinholes that are often covered with tiny focusing lenses arranged in spiral patterns2. As light passes through the series of pinholes, each is imaged by the objective to a spot on the specimen which emits a fluorescence that can be recorded once it passes back through the pinholes. The disc effectively serves as several thousand confocal microscopes all operating in parallel meaning several thousand points on the specimen are illuminated at the same time. This parallelism means that saturation is avoided and lower flurophore concentrations can be used. As the disc spins at high-speeds of 6000 rpm, spaces between the pinholes are filled in, generating a real-time confocal image that can be seen with the naked eye2. 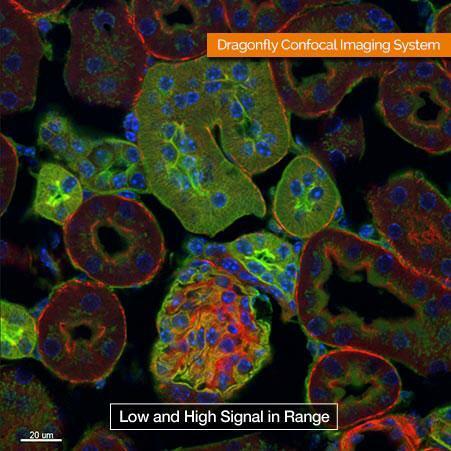 Recently, Andor, a leading manufacturer of high-performance cameras and microscopy systems, has optimized spinning-disk technology to develop a powerful spinning-disk confocal imaging platform called Dragonfly. Andor’s Dragonfly builds on and further optimizes the Nipkow or spinning disk technology to offer an unprecedented combination of speed, sensitivity and resolution5.The Dragonfly features a dual spinning disc which is equipped with an array of micro-lenses for each pinhole to maximize the transmission of light. This ensures a highly efficient coupling of the laser to the pinholes, meaning less laser power is needed to achieve high quality confocal images4. The benefits of delivering higher-efficiency imaging at lower laser powers are that the Dragonfly has more accurate cell physiology, less photobleaching, phototoxicity, and requires lower fluorophore concentration. It also is less expensive than confocal laser scanning microscopes and has superior speed and image quality than conventional spinning disc technology. Moreover the Dragonfly also operates at least ten times faster, further improving throughput time. The benefits of a higher speed include the ability to view live cells, to view larger regions of specimen in 3D stacks more quickly and the ability to study dynamic cell processes. A full overview of the Dragonfly High-Speed Confocal Platform is provided in our Webinar by Dr Geraint Wilde (Andor Product Manager Microscopy Systems) and Dr Ann Wheeler (University of Edinburgh). In the life science research setting, which increasingly demands more expedient delivery of results and accelerated throughput, this powerful new platform provides a fast, sensitive and high-resolution confocal imaging platform. The Dragonfly High-Speed Confocal Platform is suitable for the high-throughput, real-time visualization of molecules, structures and dynamic events within living cells. Furthermore, Imaris software allows further visualisation and analysis of your image data. Confocal Laser Scanning Microscopy (CLSM). Wageningen. https://www.wur.nl/en/show/Confocal-Laser-Scanning-Microscopy.htm.